Two Harvard scholars investigate the latest iteration of third-party radicalism in the United States. Skocpol (Diminished Democracy: From Membership to Management in American Civic Life, 2003, etc.) and Williamson research the Tea Party from the ground up, rooting their study in focused fieldwork surrounding three local Tea Party groups in Massachusetts, Virginia and Arizona. The authors pepper firsthand anecdotes with extensive—and at times weighty—statistical and polling data. The perspectives and opinions of the subjects are skillfully interwoven with analysis of their civic habits, economic status, religious inclinations and ideologies. 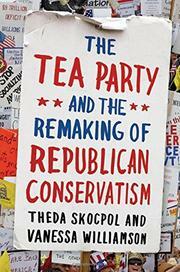 After a thorough background in the demographics of Tea Partiers, as well as their shared passions and sources of discord among this fledgling movement, the authors investigate the fascinating, and often unlikely, pairing of grassroots organizers and wealthy investors, politicos and influence peddlers who are seeking to capitalize on the media spotlight currently shining on the Tea Party. Credited with dramatically influencing the 2010 midterm elections, expectations are high as to how Tea Partiers and their core group of middle-class, volunteer-oriented proponents will affect the 2012 presidential election. According to the authors, one thing is certain: The anger many Tea Partiers express is aimed squarely at President Obama, raising the stakes for both grassroots organizers and those flush, politically minded groups seeking to ally themselves with the Tea Party. A timely study of a contemporary movement and its far-reaching effects on politics and policy.